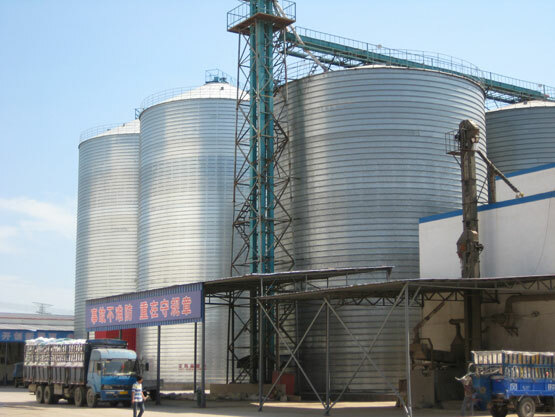 Grain silo, also named grain bin, grain storage silo, is a large grain storage container. As its name suggests, grain storage silo is used to store agriculture products for home appliance or large granary projects. 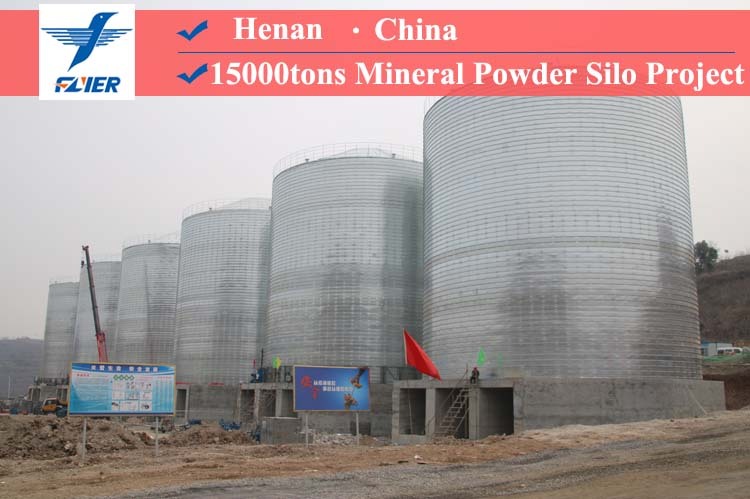 Grain silo is widely used to store grains like rice, corn, wheat, soybean, barley, sorghum, sunflower seeds, palm kernel, buckwheat, millet, bran, peas, beans, rapeseeds, beet seeds, peanut, rye seeds, flour, feed, minor cereals, and other bulk granular crops, etc. 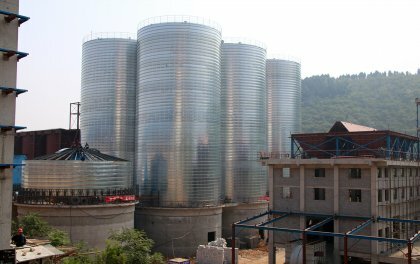 Generally speaking, grain silos can be timber silos, plastic silos, cement silos and steel silos. Among these different types of silos, spiral steel silo is now the most popular choice for grain storage because of its outstanding features. Choosing an appropriate grain storage silo is the primary task for storing grains. Flyer steel silo has the function of moistureproof, insects and rodents prevention, and is convenient to input and output grains. Air tightness of the silo is pretty good, so it is suitable for use of pesticides. 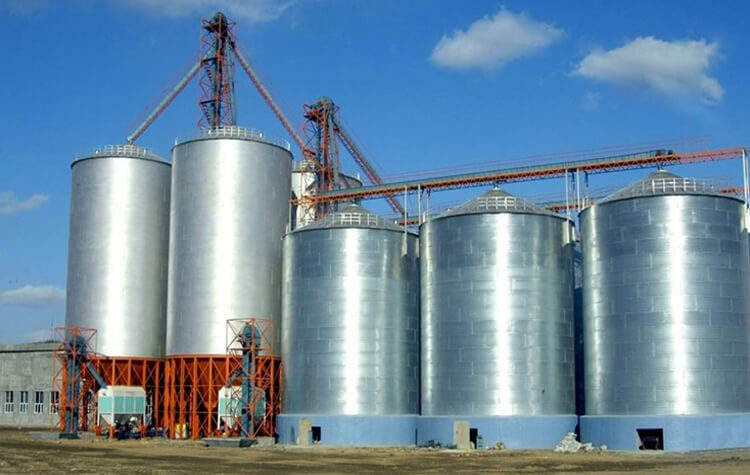 Flyer offers a wide range of galvanized steel silos for grain storage, and provides complete storage solutions and installation equipment for agricultural markets all over the world. 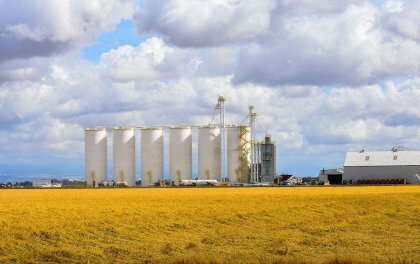 After decades of storage design and manufacturing experience, Flyer grain storage silo offers commercial users the best build-in value over the life of the product. 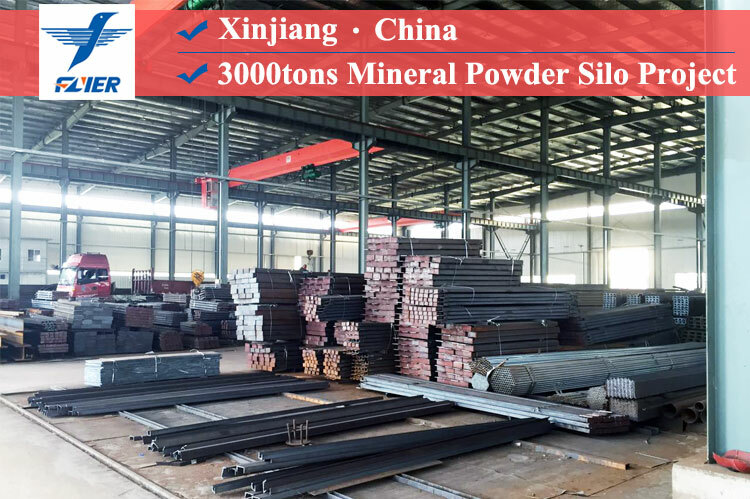 Here is the size table of Flyer steel silo with different capacities. This size table is attained by storing wheat in steel silos, and it's only for your refference. We can also design and customize grain silos according to your own needs. In order to meet the needs of grain storage, steel granary is easy to control the temperature and humidity inside the granary, effectively preventing grain deterioration. Some people build concrete silo to store grains, however, concrete silo is 6-10 times the weight of steel grain silo. To store the same volume of grain, steel grain silo's investment is just the half of that of the concrete silo. Flyer grain silo can help customers save a lot of money. The grain storage silo is made of high quality galvanized steel sheet which can be use for 30 years and never rust. 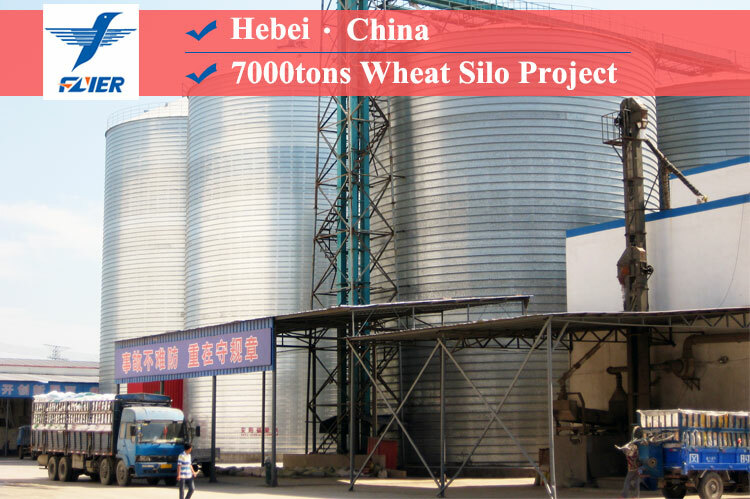 Grain silos are suitable for grain depot, feed mill, oil mill plant and farm use, etc. Elevate your grain management to new heights with a complete grain silo system. 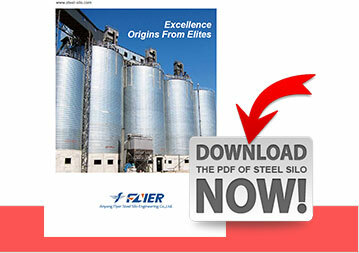 Flyer offers the highest grain silos and has some of the largest grain-holding capacities available. Spiral steel silos have perfect product durability and top quality performance. Moreover, scientific design and ventilation equipment ensure the quality and safety of the grain. Ordinary storage: Grains must be cleaned and dried, then put them into grain silos with the suitable temperature, sealed silo’s import and export, make sure a good pest control, moisture-proof, anti-rat and daily grain inspection work. Heat sealed storage: This method is the use of high temperature in summer. The grain temperature is increased after hot warehousing and achieved the insecticidal effect. Natural anoxic storage: Natural anoxic storage is only suitable for the new harvest wheat. The storage method is as the follows: Clean the new crop of wheat and then dry them as soon as possible in the sun. Put the dried wheat into grain silo within one week. Special attention should be paid to the import and export of grain silo’s tightness. 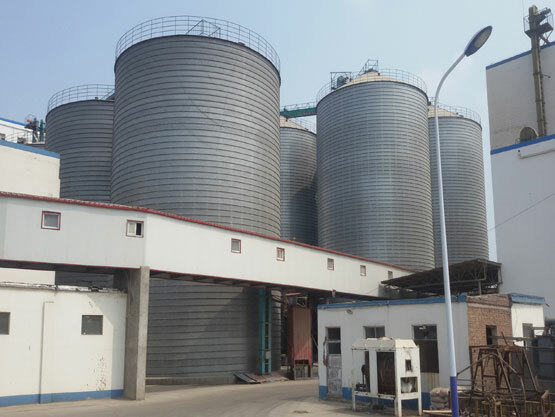 During the natural anoxic storage, workers must have a regular investigation and inspection of import and export of grain silo and make sure the whole barn in good condition. If the seal is not strict or damaged, it cannot reach the effect of anoxic storage. Storage of mixing and protective agent: The protective agent is specially used to mix to a class of grains and chemical control of stored grain insect infection. Protective agents cannot be used for rice and flour. Gloves and gauze mask should be used for mixing and using. From the above methods of grain storage, we can see special terms should be met like the storage environment, temperature, humidity, sealing etc. Flyer grain storage silo just meets all these requirements. Strong leakproofness: By use of special equipment for bending and seaming, and ensuring the quality of all parts of the silo body in process, the seal of the silo is particularly good. 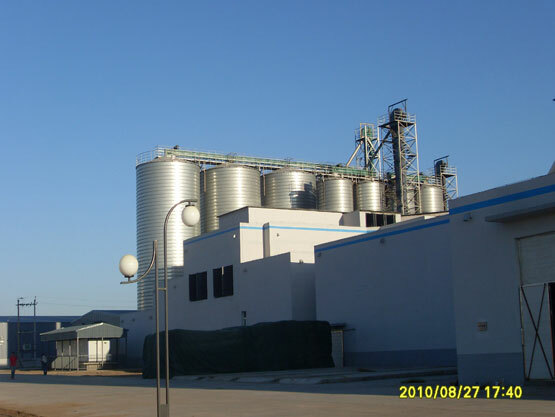 Therefore, by using the silo for storage of grain, the process requirement of pesticides and fumigation can be well met. Built-in temperature measuring device: Temperature measuring device is installed inside the grain silo. When grain temperature changes, the mobile blow ventilation device will be implemented for safety storage. Therefore silo become the most safe and effective way of grain storage without any effect from outside. Convenient and easy in operation: High automation, advanced loading and unloading equipment provides you great convenience on operation and management. Highly respect customer's requirements: We offer a wide range of grain silos which eliminate the risk of insect pests and chemical residue and whether small or large, you get a robust and innovative product. Your requirements are of utmost priority. Individual planning leads to reliable solutions, which finally means your success. Grain storage management is a very tedious work, which requires workers plenty of time to inspect grain’s storage situation regularly. What’s more, they also should consider making routine maintenance for grain silo. However, Flyer grain silo can help you to save these tedious works. With experienced and well-managed professional installation team, our grain silos are very strong, durable, and easy to operate. We have phone service every three months to remind our customers of possible problems in the course of using steel storage silo and collect advices or suggestions in product quality and the related services. We guarantee a timely reaction for arriving at the scene in 36 hours after receiving feedback. Flyer is your relieved choice.